String of pearls (Senecio rowleyanus) earned its common name with the round, bead-like leaves that line its long, pendulous stems. It performs best as a houseplant, but will survive outdoors within U.S. Department of Agriculture plant hardiness zones 8a to 10b if grown in a bright, sheltered location. 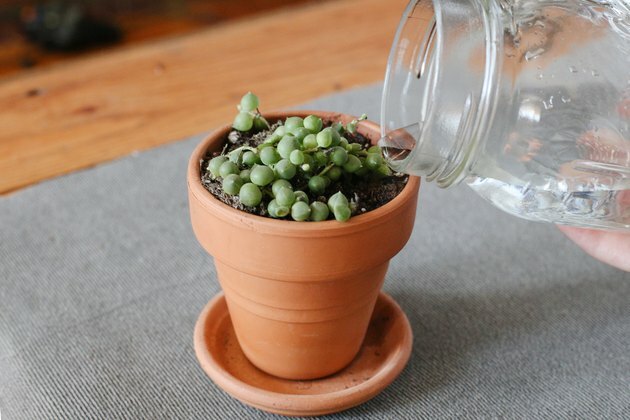 String of pearls requires minimal hands-on care and will thrive despite neglect. It will live longer and look better, however, if given occasional attention. The watering needs of string of pearls plant vary with the season. In summer, maintain a consistent yet light level of moisture in the soil. Water whenever the soil surface dries out slightly, adding water until it dribbles from the drainage holes at the base of the planter. In winter, water only when the soil is nearly dry throughout. 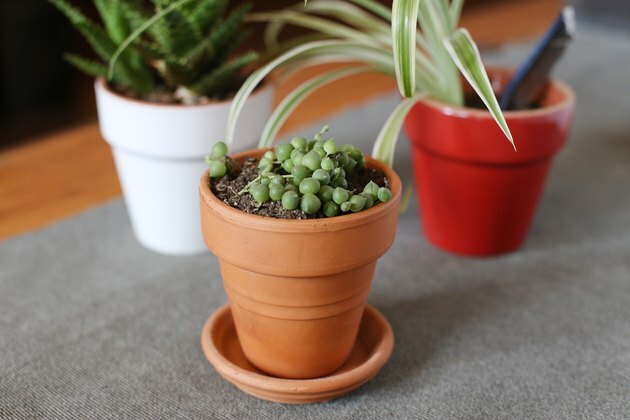 A slight wilt won't harm an established string of pearls plant, but extended dryness will cause the bead-like foliage to flatten and drop prematurely. No matter the season, provide water if signs of stress occur to prevent permanent damage to the plant. As with most succulents, string of pearls plant feeds lightly and rarely requires supplemental fertilizer. Older plants or those grown under crowded conditions, however, benefit from occasional feeding to replenish their exhausted soil. Dissolve 1/4 teaspoon of 15-15-15 ratio fertilizer in 1 gallon of water and replace one watering every two months with the solution. Winter feeding is not necessary and can promote spindly, unattractive growth. 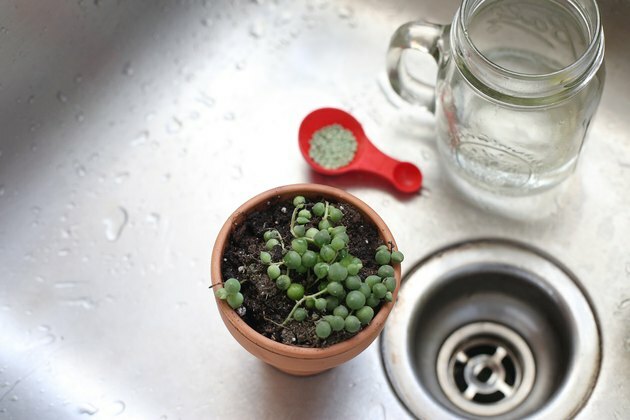 Place the plant in a sink or move it outdoors when feeding, and allow the excess fertilizer solution to drain off completely to prevent root burn. String of pearls plant reaches a mature height of just 6 inches, but its long, slender stems can grow up to 24 inches. It needs no pruning to control its size, although it benefits from light grooming year-round to keep it looking healthy and attractive. Before pruning the plant, disinfect the pruning tools to prevent the spread of disease. 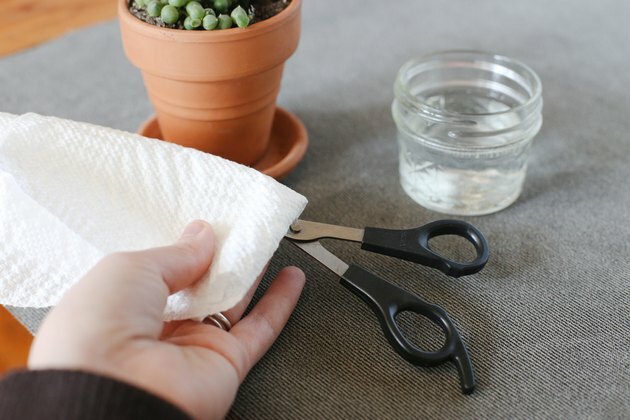 Soak the blades in full-strength household disinfectant cleaner for five minutes, rinse them thoroughly and wipe them dry. Prune off any dead, damaged or otherwise undesirable stem growth at the base. Also, snip off the tiny, cinnamon-scented flowers after they fade. Few pests or other problems bother string of pearls plants, but most decline as they age and as their soil is exhausted. Repotting will help prolong their life, as will rooting new plants from the old. 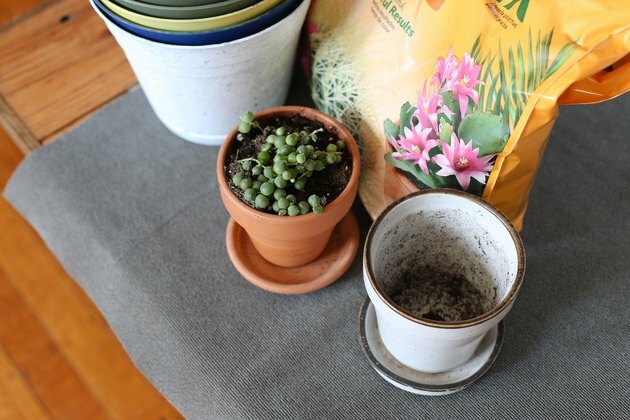 Repot younger plants each spring into a draining pot filled with sandy, cactus-formula potting soil. Older plants with very dense, fragile growth should be repotted biannually. Rooting new string of pearls plants from older, declining specimens is a simple means of prolonging their life. Take several 4-inch-long cuttings in early summer and stick them into a pot of moist medium. Place the pot in a warm, bright location. New growth will emerge in just a few weeks.